"I make it a habit to write clear, student-learning-focused learning targets." While all of the 'top ten' are important habits for us as teachers to cultivate, this one--writing clear learning targets that are focused on student learning--may be the most crucial. The foundation laid by having learning targets that are clear in your mind, that focus on what students learn and not on the topic or (worse) what the teacher does, allows us to build interesting and successful lessons. If we're unclear on what the student learning is, or if we focus on the wrong things (topic, teacher action), we won't know--and students won't know--when the desired learning has actually happened. One sign that we might be veering from clear targets is if we're having difficulty coming up with formative assessments to check for understanding. If we're confused about what we're checking for, the first place to look is at the target. The link below is to a scan of the packet to be handed out at my workshop on formative assessment at the ACCS conference (June 22, 2018). A previous post (Formative assessment and Bloom's) connected formative assessment methods with Bloom's taxonomy. The chart below moves from very simple quick-checks such as hand signals to more complex and thorough methods like harkness discussions, again connecting them to Bloom's. Below I've included only a portion of the chart. The full document is available on Google docs using the link. Pretend a classmate was absent from class today. Tell them what was most important from today’s lesson. What is the most important thing we learned today. What concept has been most difficult or confusing in this lesson/section/reading? What would you like us to review tomorrow? How did today’s discussion go? What do you need to do to improve for next time? If you were writing a quiz over today’s material, what are two questions that you would include? Write down two things you learned today. 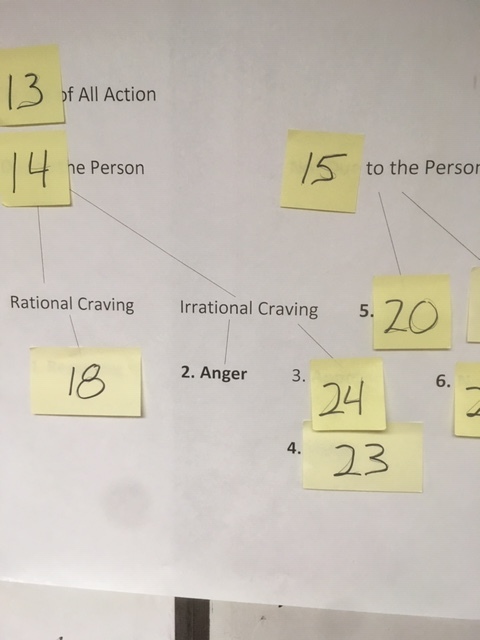 View the rest of the chart here for sticky notes, graphic organizers, discussions, etc. 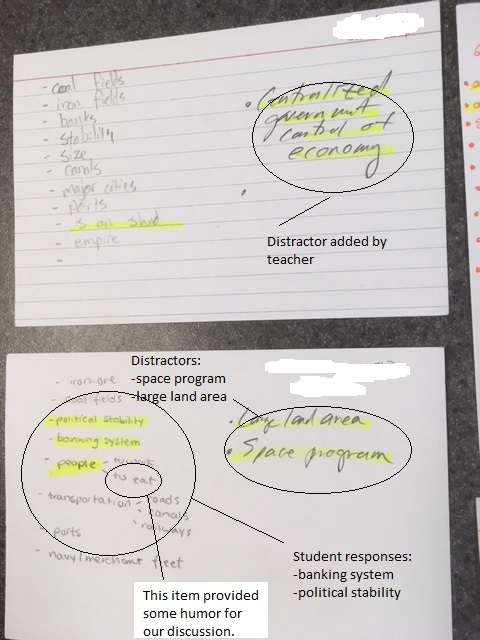 The exit passes below are examples from those collected toward the end of a recent Humane Letters 11 period to check students' recall of factors favoring Great Britain at the beginning of the industrial revolution. I used them for a quick check for understanding that period, and then the next day for a quick review and formative assessment activity. Together this only took about ten minutes. This only took a few minutes. Perhaps three for the initial list, then 1-2 for the quick round robin. Exit pass (index card) handed out toward the end of the period. Students listed from memory all of the items they could recall from our discussion that period. We then did a quick 'round robin', going as many rounds as needed to get them all. This kind of exercise may be limited for long-term retention, but it is excellent for checking for understanding (CFU). I used the exit passes the next day to review and also to check for understanding--a quick bit of formative assessment. The following took less than five minutes at the beginning of the next period. I added 'distractors' to the cards, items that were false, inaccurate, or misleading (e.g. "large population of serfs", "significant petroleum reserves"). I had the students put their heads down. Using hand signals (thumbs up for true, thumbs down for false, thumbs sideways for unsure) they responded to the items (both what they had written the previous day and the distractors) as I read them from the cards. Any incorrect or uncertain responses we discussed. Students explained their answers, with scaffolding and follow-up, as needed. If all were in agreement a student might be asked to explain their response. Any items not read were added and discussed together. Sticky notes are an easy and flexible means for checking for understanding. The variety of sizes and colors make them adaptable to many kinds of tasks. They're great for facilitating discussions. - adding to, deleting, prioritizing, re-combining, moving to different category, etc. Stickies are easily moved around on the white board (or chalk board), so this makes re-organizing simple and non-permanent. Students can be asked to record any final product (or questions, etc.) in their composition books before the stickies are removed. 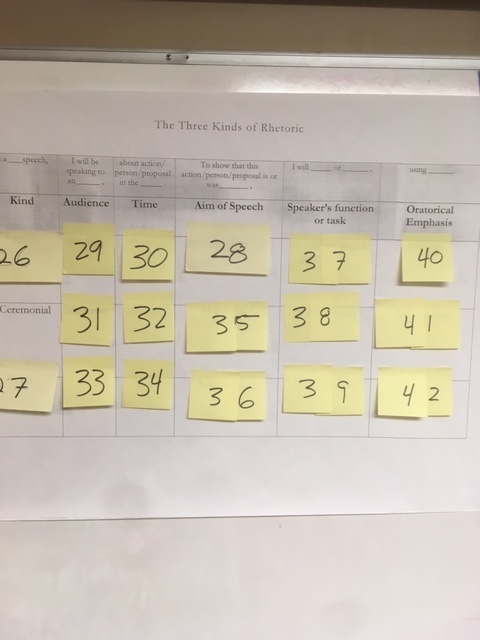 Characters and Themes, A Tale of Two Cities: In small groups, students were given stickies with the main characters introduced early in the novel. Groups decided where these characters best fit under main themes thus far in the story: 'Buried', 'Recalled to Life', etc., as well as those whose role was uncertain. Simple, but a great discussion starter. 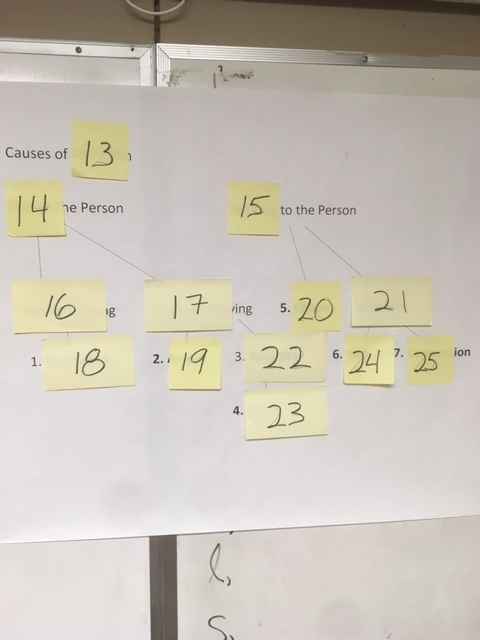 Long-term & Immediate Causes of the Renaissance: Students worked in small groups, with long-term using one color, immediate another color; each group posted on board; discussion, re-ordering, etc. followed. Cause/Effect, Russian Revolution: Group 1 wrote causes on one color, group 2 wrote effects on another, groups 3 & 4 selected key events leading up to and after the revolution. These were posted on the board. Each group presented briefly, with class discussion following. Discussion Prep (17thc. 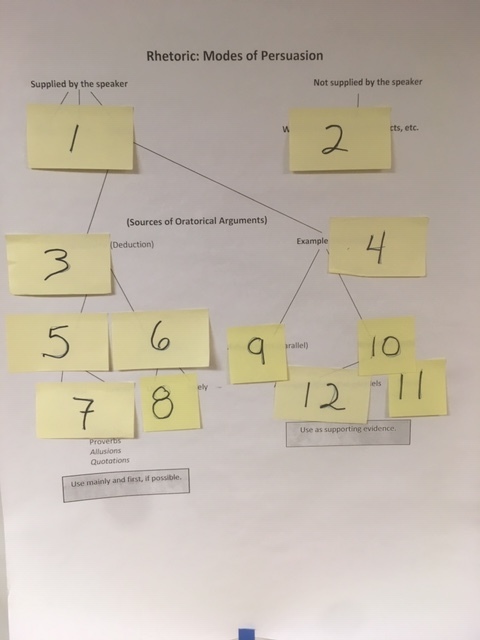 France): Groups with large stickies wrote on four areas: Group A- 3 connections to previous learning; Group B- 3 most important ideas/themes; Group C- 3 excellent questions; Group D- 3 most interesting facts/points. Discussed as class, adding and refining as needed, prioritizing what items to focus discussion on. Action & Character discussion, Pride and Prejudice: The (first) Proposal, The Letter-- sticky notes for: Darcy's actions for both, Elizabeth's actions for both; Darcy's character traits revealed by his actions for both, Elizabeth's character traits revealed by her actions, for both. Place on board and discuss. Key Dates Review: Students placed individual events on the board in order; other students took turns (cold call!) re-organizing as needed, until sequence is complete. Students then placed dates over the events, following above process. We then had students try to recall the event under the date. For more information on formative assessment, check above under Resources for 'Formative Assessment from Hand Signals to Harkness Discussions'. Individual student white (dry erase) boards are an outstanding means to regularly check for understanding. White boards are inexpensive, easy to use and easy to store. They have the advantage over paper of not being ‘permanent’, so students are often more willing to take risks than if they were working on paper. White boards are excellent tools for younger students as well as for high schoolers. White boards enable the teacher to do a quick, full-class check for understanding. Misunderstanding or imperfect recall is easily seen, so the teacher will know if review is necessary for the class or for groups of individuals. I t is most effective for students to have one consistent time and place for study. Studying a new concept right after you learn it doesn’t deepen memory much. Changing the venue for studying can improve ‘retrieval strength’—the ability to remember the content studied—by as much as 40%. Guessing wrongly when studying tends to interfere with later recall. Attempting to communicate what you’ve learned is 20-30% more powerful than reviewing an outline. Giving the mind a break when stuck is counter-productive—it’s best to just ‘power-through’ problems. People often remember more of what they’ve left incomplete. Varied practice of many related items is more effective than concentrating on one skill. 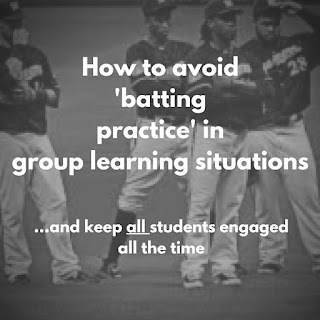 Interrupted and scrambles practice sessions lead to less learning over time than focused and uninterrupted study. See here for a summary of the chapters and recommendations from 'How We Learn'. This is a resource we used at Veritas during a recent professional development day. Teachers are leaders in their classrooms, every bit as much as coaches with their teams or administrators with the school as a whole. How teachers lead has a tremendous impact on the cultures within their classrooms. 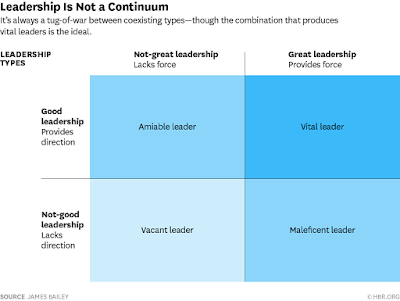 One way to think about leadership is to consider leadership not so much as a continuum between bad and great, with good somewhere in between, but rather, to understand effective leadership as the existence of aspects of both ‘good’ and ‘great’. James R. Bailey, in a September 22, 2016 Harvard Business Review article, explains this view of leadership. · ‘Great’ leadership is that which provides clear movement and direction toward fulfilling the mission, holding up the aspects of excellence, and setting goals. This leadership works to equip, inspire, and hold accountable, so that those goals are attained. This is what he calls ‘force’. · ‘Good’ leadership protects and supports ethical and moral principles. It focuses on relationships and providing values, ‘direction’, for the organization. The truly effective leader, the Vital leader, for Bailey, combines both of these, providing clear goals and continual force (inspiring, equipping, and requiring) toward accomplishing them, while at the same time creating an ethical, supportive, trusting environment. The Amiable leader has good intentions, but the power or the will to implement them is lacking. This creates a stagnant, “pleasant enough place to work, but one bereft of the vitality necessary” to advance the organization’s goals. This leader can be described as amiable—friendly and pleasant. But nothing gets done. 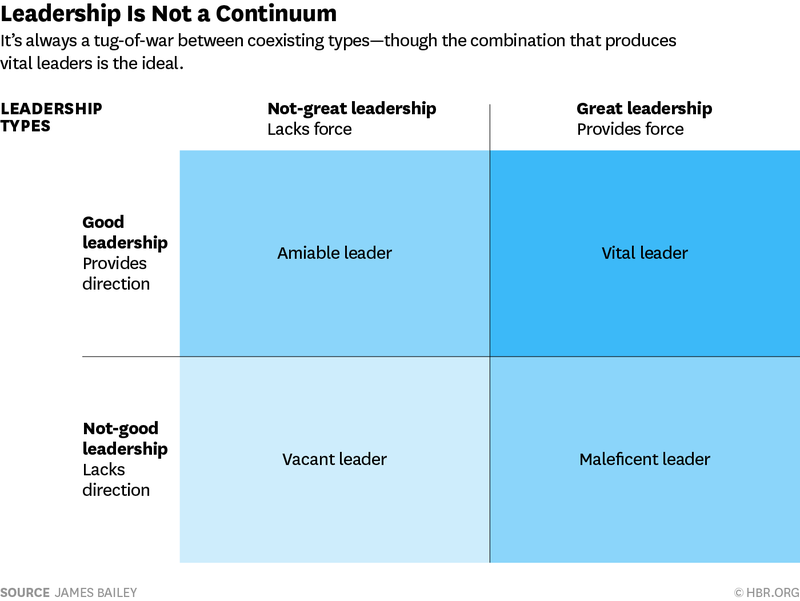 The bottom left quadrant, the Vacant leader, is a combination of lack of force and lack of good direction. “There is none of the energy necessary to compel collective movement to an end goal.” And there is none of the ‘good’ found in upper left. This is a not-good, not-great “cesspool”. The bottom right, the Maleficent leader, combines great force without direction for good. “It’s an environment of excitable, concentrate participation coupled with dubiously defined purpose.” The ‘great’, without the ‘good’, can result in harm for all involved. 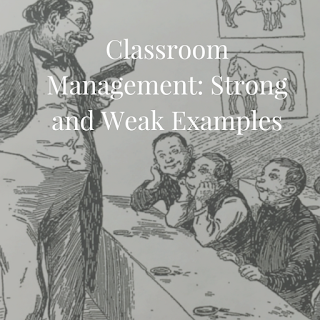 A classroom culture that is both ‘great’ and ‘good’ is a reflection of the character of the teacher and how that teacher carries out his or her work in the classroom. Classroom teachers strive for an environment that is both predictable and supportive, that works diligently and compellingly toward continual, stretching and inspiring learning. It does this in a classroom that is focused on the goal of wisdom, virtue, and godliness as the context for all the learning going on. Recent research into teacher development has confirmed that great teaching is the result of systematic efforts in schools to provide on-going support of growth. Conferences, guest speakers, and blogs are fine as far as they go, but the real benefits come when teachers work with others consistently on concrete goals with the opportunity for feedback. Also interesting in this research is the benefit of some specific strategies to improve learning. Some popular approaches, such as ability grouping and individualizing instruction, show minimal improvement or worse. Reducing class sizes, though somewhat effective, comes at a prohibitive cost. 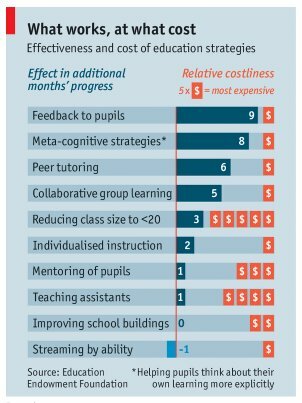 What is most effective in improving learning, those items at the top of the chart below, show not just the greatest benefit but also at the least cost. Best of all, these strategies are available to all teachers in all classrooms, and do not require potentially disruptive or expensive restructuring of schedules. Of course, not all methods are created equal, and while teaching students to think about their own learning (meta-cognitive strategies) fits very well in classical, Christian education, strategies such as peer tutoring and collaborative group learning require more careful application. If one thinks of peer editing as tutoring, and seminar discussions as collaborative learning, then these become easier to imagine as methods for classical, Christian schools. Readers of Chappuis' Seven Strategies of Assessment for Learning will recognize the top two strategies as central to the Seven Strategies. The following is a list of representative observations or behaviors developed by Veritas School teachers during our discussion of the 'skilled in managing classroom procedures' item on our Characteristics of Teaching Excellence. In Philippians 1:9, Paul writes that it is his prayer for his readers that their “love may abound more and more, with knowledge and all discernment, that you may approve what is excellent”. This encapsulates well our goal for our students at Veritas. We desire that they will grow in wisdom, virtue, and godliness through their years with us, that their love for God and for others would abound. Ours is not merely an intellectual enterprise, but one in which learning is directed toward an end that is greater than academic achievement. As such, we must consider for what purpose we are learning, and any limits or boundaries of that learning. The purpose of learning is, like everything else in life, to move us closer to loving God with all of our hearts, minds, souls and strength, and our neighbors as ourselves. Anything else, any other motive, moves us away from that and therefore from our true purpose. C.S. Lewis writes in The Abolition of Man about his desire for a kind of learning that “would not do even to minerals and vegetables what modern science threatens to do to man himself.” He warns against the modern approach to education that tends toward an emphasis on power and control, rather than toward humility and gratitude. In this he is echoing a concern found in sources as different as Augustine, John Milton, and even Mary Shelley. It is an enduring problem because learning, like all things human, can be made to serve and to glorify the living God or it can be bent to serve the whims of fallen man. Too often, of course, the latter has been the case. We find this problem frequently described using the terms curiositas and studiositas. Not all desire for learning is appropriate or lawful. Curiositas, instead of meaning a healthy wonder, was used describe a vice that desired knowledge that is novel, or an appetite that is prideful and is intently interested in knowing for its own sake, with possessing knowledge in a way that gives control or power to the knower. It is intensly selfish, and while the ‘curious’ in this sense may discover useful things, they do not acknowledge the source. There is no gratitude for the gift or the giver. Augustine writes that the ‘curious’, rather than loving and being thankful for knowledge, actually “hate the unknown because they want everything to be known and thus nothing to remain unknown.” They cannot abide the fact that, ultimately, mastery is impossible. It is simply not possible to fully plumb the depths of the creature let alone the Creator. Creation is a constant reminder to man that he is a limited and fallible creature. This is hateful to the ‘curious’, and so they end with hating the creator of it all. The object of curiositas is control and power, and its result is ultimately unbelief. Milton also warns against the desire for knowledge that is inappropriate, that is, not regulated by virtue. In Paradise Lost, Adam and the angel Raphael have a long discussion that ranges from the history of the cosmos to the war in heaven between the faithful and fallen angels. In this discussion, Adam learns much and the angel commends his desire to understand more about God and his ways. But there is a potential danger that Raphael presents to the unfallen Adam. After approving Adam’s questions about the working of the universe, the angel gives this direction: “…the rest from man or angel the Great Architect did wisely to conceal and not divulge his secrets to be scanned by them who ought rather admire.” Milton says here through the angel that people, in our desire to understand, need to be careful that this knowledge leads us to admire God and not just to analyze (‘scanned’). To understand is to worship. This is the essence of ‘studiositas’. It doesn’t mean what we mean by the contemporary word studious, someone who merely has their nose in a book all the time. The ‘studious’, in the older sense, understand that the fear of the Lord is the beginning of wisdom. Studiositas looks for permanence, an eternal perspective that inspires astonishment and joy. It is a virtue that seeks the sublime rather than the mundane, and it leads to devotion, wonder, and gratitude for both the creature and the Creator. The result is worship, and a practical wisdom that both glorifies God and relieves somewhat the present suffering of this fallen world, as an act of service. While my companion contemplated with a serious and satisfied spirit the magnificent appearance of things, I delighted in investigating their causes. The world was to me a secret which I desired to divine. Curiosity, earnest research to learn hidden laws of nature, gladness akin to rapture, as they were unfolded to me, are among the earliest sensations I can remember. A human being in perfection ought always to preserve a calm and peaceful mind and never to allow passion or transitory desire to disturb his tranquility. I do not think that the pursuit of knowledge is an exception to this rule. If the study to which you apply yourself has a tendency to weaken your affections and to destroy your taste for those simple pleasures in which no alloy can possibly mix, then that study is certainly unlawful, that is to say, not befitting the human mind. Of course, the opinions of a Romantic novelist are not normative for us, but Shelley has the unhappy Frankenstein give an important warning that we would be wise to heed, about an unbridled, unrestrained lust for knowledge and power. At Veritas, we certainly want students to be curious in the contemporary meaning of the term—interested in many things and learning from a sense of wonder—and classical, Christian education is clearly not anti-intellectual. We joyfully recognize that all wisdom and learning flow to us as gracious gifts from the Father. But all of this, whatever we learn, ought to be guided toward the fear of the Lord that is the beginning of wisdom. Knowledge is a magnificent, astonishing gift, and accordingly, the pursuit of wisdom should be a virtuous and godly undertaking. The purpose of learning is to grow to love God with all of our hearts, minds, souls, and strength, and to love our neighbor as ourselves. This is ‘studiousness’, the satisfying of our desire for the sublime and the great, found only in knowing God rightly. 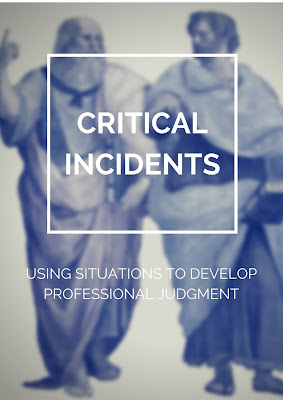 In our secondary faculty meetings recently we spent several weeks discussing through 'critical incidents'. These were classroom scenarios, some real and some fictitious, that provided opportunities to refine our professional judgment by discussing the situation from many different angles. What makes the incidents 'critical' is not their seriousness--many were routine or mundane situations--but the critical approach we took to discussing them. They were situations subjected to detailed and systematic critique and analysis. 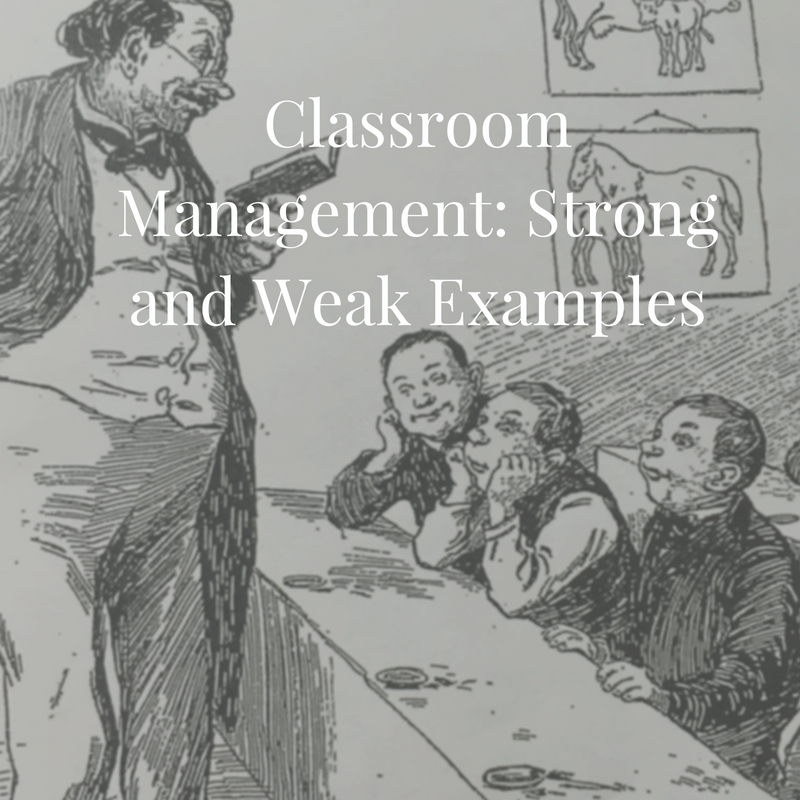 The goal was not preparation for these situations specifically, but the refining of a professional judgment adaptable to the many and varied situations that teachers encounter. Below is one of the critical incidents we discussed and the form with the kinds of questions we worked through. The right hand column contains some of the questions and comments that teachers raised during our discussion. A small group of high school students respectfully approached the headmaster with a concern. They said that one of their teachers was addressing what they considered minor problems (e.g. students arriving late to class) in what felt to them to be a public way, thus setting a negative tone for the class as a whole. They wondered what could be done about this situation. -Students not parents came to Head w/ issue—why? -Which students? Same as ‘offenders’? -Had they discussed this with the teacher? -Are standards clear? Are procedures clear? -What about our motivations? Irritations? -Staying objective =supportive? -How do they arrive late--attitude, actions? -They think ‘minor'—do they understand the importance of these situations? Why did (does) it occur? -Is there something in the school that causes this? -Is it only certain students being called out? Does it contribute to the mission? Does it support the POG? Is it classical? Is it Christian? Is it true? Is it just? What does it model or shape? -Was this ‘initiate respectful dialog' (Portrait of Graduate language) or complaining?